Both sides in the Edinburgh tram dispute are meeting to try to break the deadlock that has brought work on the £545m project to a virtual standstill. A contractual dispute between the tram company Tie and contractors Bilfinger Berger has pushed the project over budget and behind schedule. Tie has refused to give any details of the mediation process. But it is understood talks are taking place at a hotel and will include Transport Scotland representatives. It is thought the negotiations could take up to two weeks to complete. Tie's chief executive, Richard Jeffrey, said: "Mediation is a critical juncture for the tram project and I am confident that all parties can work together to find a way forward. "While we understand that there is a lot of interest in the process it is vital that it is carried out in private in order for us to gain the best deal possible for the city, and all those involved have agreed to maintain a policy of confidentiality throughout." 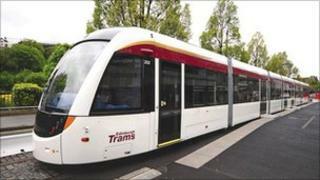 Sue Bruce, council chief executive, said: "I believe everyone involved in the tram project, as well as the people living and working in Edinburgh, has a vested interest in the outcome of the mediation process. "We all want to see the project continue as quickly as possible and get trams running in the city, however it is crucial that those involved are given the opportunity to work to find a solution for going forward." The Scottish government has capped its investment in the project at £500m, with the city council paying the remainder. The local authority has been taking steps to increase its contribution to up to £100m to cover additional costs, but council chiefs have said they do not know how far a £600m budget will go. It is hoped the route will be finished by the end of 2013.